I have always been drawn to bold patterns and colors. When I was younger going to museums were an essential part of my upbringing. I still find peace going to a museum and just walking around looking at art. At Lacma, besides the art inside the museum, there is art outside the museum. The Lacma installation is a definite must see, and of course a great spot to take pictures. With such an amazing backdrop, wearing something equally visually bold was needed. 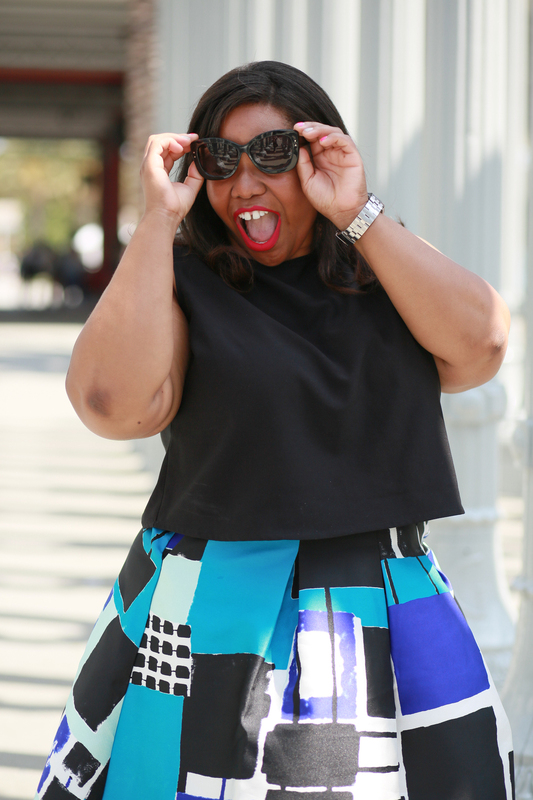 This skirt from Lane Bryant was the perfect item for a gorgeous day. What I love about it is the bold color. The shades of blue play nice with black and white to take a fit & flare skirt to the next level. With a skirt so pretty, all I needed was a slightly cropped top, sandals, and my oh so favorite Christian Siriano for LB shades and I was photo ready. Besides avoiding all the other patrons taking pictures, we got to have some fun dipping in and out of the rows of lights. This was the first stop on our day of shooting and I think the IG Wives hit it out of the park. I'm so used to just shooting with the tripod or the wives taking pictures, it was cool to have photographer Fabulizza who has such great energy, and just the sweetest person take them. She really captured me: a little sassy, and all around playful. I think we look great in our skirts. A fit & flare skirt will always be a staple for the IG Wives. This silhouette makes everyone look good. For details on what my wives wore, click here & here. You can wear color, and still look great. Turn yourself into a work of art, and be a visual feast for the eyes.